Baghdad. For the first time since driving out Islamic State, Iraqis go to the polls on Saturday (12/05) in an election that will shape attempts to heal the country's deep divisions and could shift the regional balance of power. Iraq's three main ethnic and religious groups, the majority Shi'ite Arabs and the minority Sunni Arabs and Kurds, have been at loggerheads for decades and the sectarian rifts are as apparent as ever 15 years after the fall of Saddam Hussein. The election of a new prime minister and parliament also takes place the same week US President Donald Trump announced he was pulling out of the Iran nuclear deal, raising tensions between Iraq's two main allies: Tehran and Washington. Whoever wins the May 12 election will face the challenge of rebuilding Iraq after four years of war with Islamic State, jump-starting a flagging economy, balancing the interests of powerful foreign patrons and maintaining the country's fragile unity in the face of sectarian and separatist tensions. "We want security. We have killings, theft, kidnappings. We never had this before. In the past 15 years the people have been destroyed," said 29-year-old Khalid Radi, a laborer in Baghdad. Incumbent Prime Minister Haider al-Abadi is considered by analysts to be marginally ahead but victory is far from certain. Even though he announced Islamic State's defeat during his first four-year term, diffused sectarian tensions inflamed by his predecessor, and maintained Iraq's unity in the face of a Kurdish independence bid, he faces a tough battle. Abadi has faced criticism about persistent government corruption, tough economic conditions and the austerity measures his cabinet introduced after the slide in global oil prices and to help pay for the fight against Islamic State. He also cannot rely solely on votes from his community as the majority Shi'ite voter base is unusually split this year. Instead, he is looking to draw upon support from other groups. Many, but not all, Sunnis see Abadi as a less sectarian alternative to his two main Shi'ite rivals and credit him with liberating their areas from Islamic State. There's bad blood between Abadi and the Kurds, however, after Baghdad imposed sanctions on the semi-autonomous Kurdistan region following its failed independence bid last year. Even if Abadi's Victory Alliance list wins the most seats he still has to navigate the long-winded and complicated backroom negotiations required to form a coalition government. His two main challengers are his predecessor Nuri al-Maliki and Iranian-backed Shi'ite militia commander Hadi al-Amiri. Both have a more passionate voter base than Abadi, who is mostly appealing to more pragmatic voters who see him as having better relations with the outside world and a cross-sectarian appeal needed to avoid further bloodshed and attract investment. Like Abadi, Amiri is running on a platform highlighting the victory against Islamic State, though the militia leader's narrative is more compelling as he was a frontline commander and is viewed as war hero by many Shi'ites. Maliki, who was sidelined after eight years in office in 2014 after losing a third of the country to Islamic State, is looking to make a political comeback. In contrast to the cross-sectarian message of Abadi, Maliki is again posing as Iraq's Shi'ite champion and is proposing to do away with the country's unofficial power-sharing model in which all the main parties have cabinet representatives. Ever since Saddam fell in 2003, ending decades of dominance by the Sunni minority, senior government positions have been unofficially split between the country's main groups. The post of prime minister has been reserved for a Shi'ite, the speaker for a Sunni, and the ceremonial presidency has gone to a Kurd - with all three being chosen by parliament. More than 7,000 candidates in 18 provinces, or governorates, are running this year for 329 parliamentary seats. The Iraqi constitution sets a 90-day deadline for forming a government after the election results are formally announced and the horse-trading can be protracted. The new government will also have to cope with the simmering tension between the United States and Iran. As prime minister, Abadi has won praise for his deft juggling of the competing and colliding interests of his two main backers. While his government maintains good relations with Iran, he is seen as balanced and Western diplomats say he would be the easiest candidate to work with. Maliki, who pushed for US troop withdrawals and Amiri, who speaks fluent Farsi and spent years in exile in Iran during the Saddam Hussein era, are both seen as much closer to Tehran. The election is also taking place in an atmosphere of division and disillusionment within Iraq's three main groups. The Shi'ite vote is split as many are unhappy with their leaders after 15 years in power that have only yielded violence and unemployment and left the country's infrastructure crumbling. But if the Shi'ites are split because they have too many leaders, Sunni Arabs are divided because they have none. Sunnis are at their lowest point yet. Millions languish in displacement camps, many are out of pocket and trying to rebuild destroyed homes in cities reduced to rubble - and they feel collectively branded as Islamic State sympathizers. The Sunni politicians that have held positions in government are largely discredited and there is no national Sunni leadership or party structure. Iraq's Kurds, meanwhile, blame their leaders for gambling away hard-won autonomy in the failed independence referendum and might punish them by voting for non-traditional parties, which in turn could undermine the historically unified Kurdish bloc's position as kingmakers in parliament. Voters go to the polls on Saturday, though security forces and Iraqis abroad started voting on Thursday. The electoral commission has said results will come "hours" after polls close. 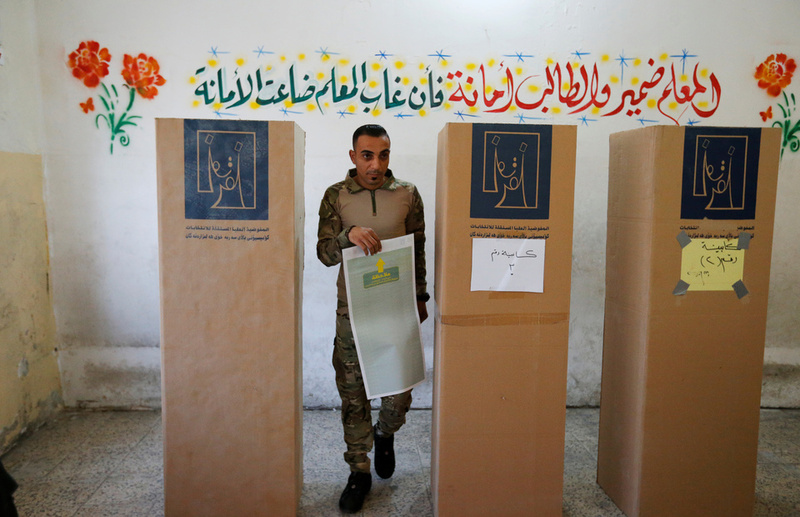 Islamic State has threatened to attack polling stations amid a recent uptick in security incidents in areas retaken from the militants while many voters simply do not feel the election will bring any change. "I propose the state just cancel parliament. Shake it and uproot it," said 27-year-old mechanic Mustafa Tabbar using a popular Iraqi phrase meaning radical change.